In case you haven’t heard, B Squared is hosting the first annual HELLO Conference on March 28, 2019. Tickets are on sale until this Friday, March 22nd – so make sure to grab your spot if you haven’t done so already! We’re super excited to be hosting the HELLO Conference – not just because it’s our first ever B Squared event, but because we have an incredible line-up of speakers, including our keynote, Mark Schaefer. Mark is world renowned author, speaker, college-educator, and just an overall awesome guy. He’ll be discussing his latest book, Marketing Rebellion: The Most Human Company Wins at the conference next week but was kind enough to sit down for a session of B2TV ahead of time. Mark dug into the current state of marketing and why it’s so important for brands to be human, even in our current world of digital transformation. If you want to stock up on loads of marketing insight, check out our interview with Mark below! In case you haven’t heard, B Squared is hosting the first annual HELLO Conference on March 28, 2019. Tickets are on sale until Friday, March 22nd – so make sure to grab your spot if you haven’t done so already! 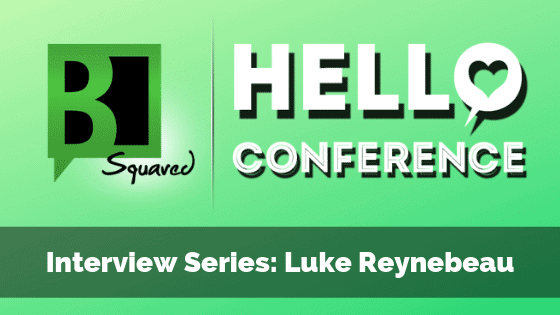 We’re super excited to be hosting the HELLO Conference – not just because it’s our first ever B Squared event, but because we have an incredible line-up with seasoned pros like Luke Reynebeau, Senior Manager, Partner Marketing at Sprout Social. Luke was kind enough to sit down for a session of B2TV with us ahead of the HELLO Conference where he discussed all things Social Listening – what it means, how it differs from social monitoring, and why brands should be doing it. If you’re interested in learning more about social listening and how it can help you be a better marketer, check out our interview with Luke! In case you haven’t heard, B Squared is hosting the first annual HELLO Conference on March 28, 2019. We’re super excited about this! We’re excited not just because we’re hosting our first ever B Squared event, but because we have an incredible line-up with seasoned pros like Katie Robbert of Trust Insights. Katie was kind enough to sit down for a session of B2TV with us ahead of the HELLO Conference where she discussed the different types of predictive analytics and what this means for marketers. If you’re already feeling confused and overwhelmed by the concept of predictive analytics, have no fear! Katie did an awesome job of breaking down it down so we all can understand not just how it works, but how it can be of benefit to us. If you’re interested in learning more about AI and predictive analytics, check out our interview with Katie. As some of you may know, B Squared is hosting the first annual HELLO Conference on March 28, 2019. We’re super excited about this. We’re excited not just because we’re hosting our first ever B Squared event, but because we have an incredible line-up with seasoned pros like Christopher Penn of Trust Insights. Chris was kind enough to sit down for a session of B2TV with us ahead of the HELLO Conference where he explained Artificial Intelligence (AI) and Machine Learning (ML) in a way we can all understand. Yes, it’s possible! Are the robots coming to take our jobs? Can AI really help us scale? Chris, the go-to guy for machine learning and marketing analytics, answered these questions for us and gave us a sneak peek at what he’ll be discussing at the conference. If you’re interested in learning more about AI, but are overwhelmed by the concept, check out our interview with Chris.